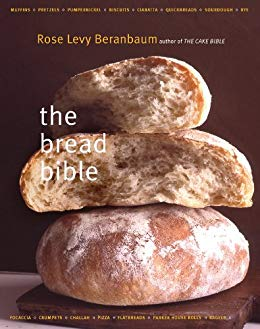 Winner of the Gourmand World Cookbook Award, Best Bread BookThe Bread Bible gives bread bakers 150 of the meticulous, foolproof recipes that are Rose Levy Beranbaum's trademark. Her knowledge of the chemistry of baking, the accessibility of her recipes, and the incomparable taste of her creations make this book invaluable for home cooks and professional bakers alike. "Understanding" and "Pointers for Success" sections explain in simple, readable language the importance of various techniques and ingredients demonstrated in a recipe, providing a complete education in the art of baking, with thorough sections on types of flour, equipment, and other essentials. Easy-to-use ingredient tables provide both volume and weight, for surefire recipes that work perfectly every time.Recipes include bread made with yeast starters, quick breads, flatbreads, brioche, and much more. From ciabatta, semolina, rye, and sourdough breads to bagels, biscuits, crumpets, and pizza dough, The Bread Bible covers all the baking bases.